The Gunpowder River is clear, flowing at 52 CFs and is 51 F. The River is about 10 degrees warmer than it is on average this time of year so expect to find some fish ready to pounce on streamers over the holiday weekend. Start with a 9ft 5x leader and add a bit of 6x.Large stonefly nymphs followed by a zebra midge is a great way to cover pocket water. 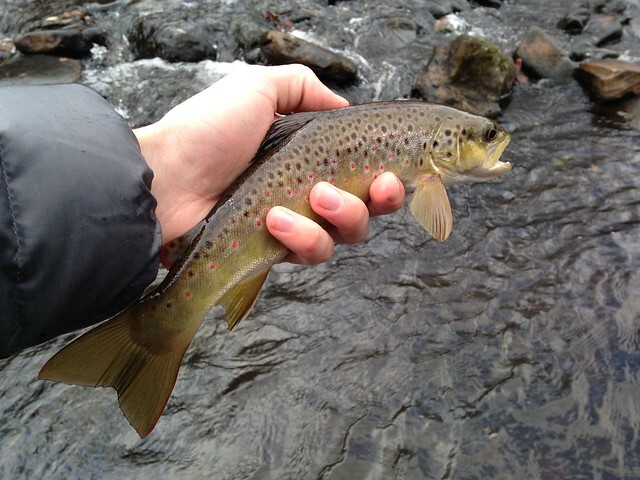 Light-Brite zonkers and sculpins should be drifted through the pools and soft-hackles have been working fine in the riffles. Remember that spending time with friends and family on the River can’t be beat! –Have a Happy Thanksgiving! Be sure to stop in to check out some great “in-store only” sales on select clothing, rods, reels, lines, and wading boots starting this Friday through Sunday. This entry was posted in fishing report on November 23, 2015 by Theaux Le Gardeur. Spring-Like Water Temperatures on the Gunpowder! The Gunpowder River is clear, flowing at 42 CFS and is 57F. Take advantage of spring-like water temperatures along the Gunpowder River. These temps are about ten degrees above normal for this time of year and are making the wild fish very active. 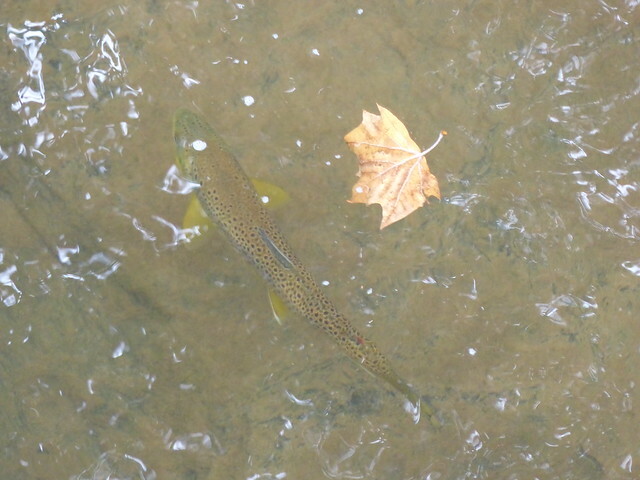 Fish streamers now by hiking the trails quickly from York Rd to Falls Rd and focus on fishing the bend pools. Use the leaves as a guide to where the small Blue-Winged Olives, ants and midges will be in the flat water between the riffles. Now is the time to limit your wading so as not to disturb any redds. This entry was posted in fishing report on November 16, 2015 by Theaux Le Gardeur.